Q: Is this debtor education course taken before or after I file for bankruptcy? Q: If I am filing jointly with my spouse, do we take the course together or separate? A: You will each participate in the course under separate accounts meaning that each of you must register and pay for the course on your own. Q: How much does this debtor education course cost? A: Just $9. You may pay with a credit card, debit card, pre-paid debit or crerdit card or send us a money order. A: Refunds are available upon request for students that pay for, but do not participate in the debtor education course and for those that experience technical issues that cannot be solved. It is our goal to work with each participant and make sure their experience is a positive one. A: Your registration, payment and personal details are protected and encrypted against unatuthorized use and access at all times. 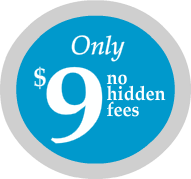 9 Dollar Debt Education will not distribute your information to any third party for any reason, at anytime. Q: How long will this debt edcuation course take me to complete? A: The course is 2 hours long. You may log on and off at anytime to participate. Course timers appear on the page during each lesson. This lets you know how much time is left on the lesson. Once the timer reaches 0, you may continue to the next lesson. Q: How will I get my certificate of completion? A: Your certificate will be emailed to you. If you do not have an email address, ask someone you know if it would be ok to list their address for the delivery of your certificate, or better yet, sign up for a free email address at gmail.com. Q: How soon will I get my certificate of completion? A: Your certificate will be emailed to you within 24 hours if you select our rush processing option. Otherwise, expect to see your certificate within 72 hours after you complete the course. If more than 72 hours have passed since you have completed the course, check your email spam or junk mail folders. Note: Rush processing does not apply for completions that occur on weekends and holidays. All rush orders will be processed the next business day following a weekend or holiday. A: Your case number is on your bankruptcy case paperwork. Different courts present it in different format; we need the two numerical digits for the year, and the five numerical digits that follow. For example, your bankruptcy case number may look like this: 11-12345. If it looks like 2:11-bk-12345-abc, use "11-12345". Q: Can my debtor education certificate be sent to my attorney too? A: Yes! Simply include your attorney's contact information during enrollment. Q: Is this debtor education course approved? A: Yes! Our company is approved to provide an instructional course in personal financial management as required under the Bankruptcy code, and approved to issue certificates evidencing completion of a personal financial management instructional course.